In the traditional artist-muse love stories, we’ve seen remarkably few focused on female artists and their male muse. 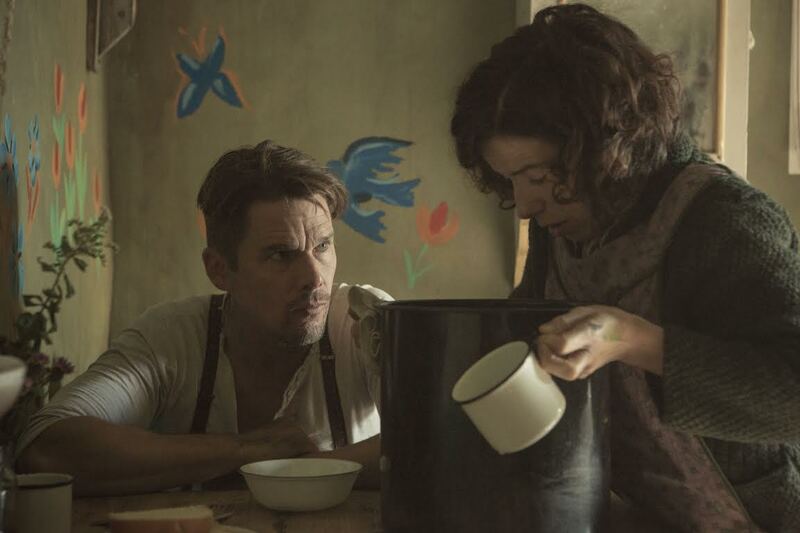 And rarer still would be the on-screen relationship in the new Irish-Canadian film Maudie, starring Sally Hawkins and Ethan Hawke. 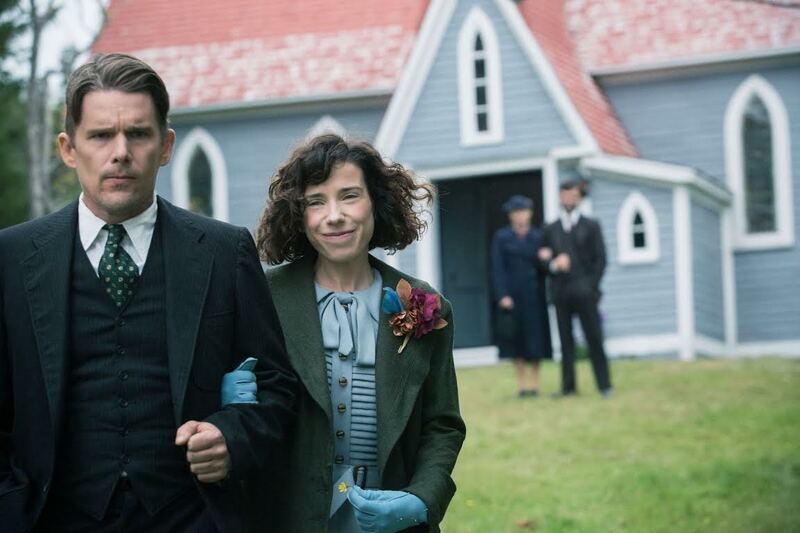 Based on the cheerful, vibrant art of folk artist Maud Lewis (Sally Hawkins) plays a Nova Scotia woman who goes to work and eventually marries a gruff farmer Everett. 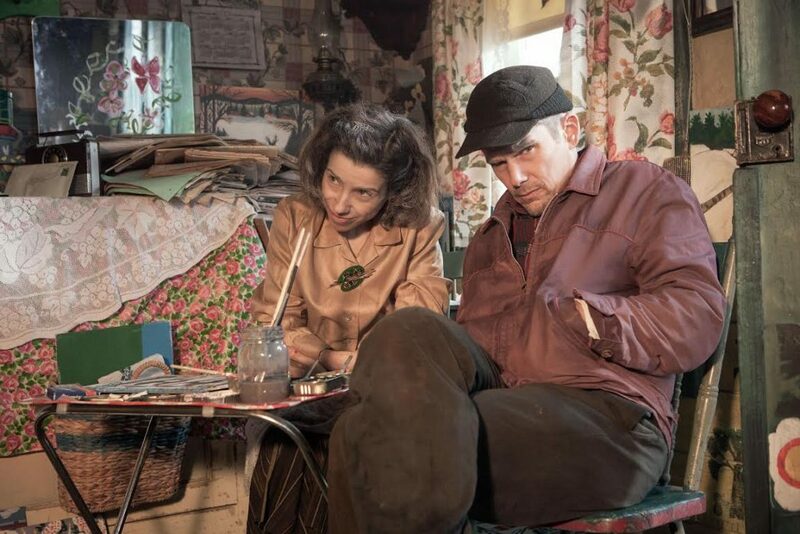 While Lewis’s unconventional marriage could have been translated into a melodramatic biopic, Maudie’s downplays the “true story” tagline to focus on their blossoming relationship with true warmth and humanity. Benefiting from Oscar caliber performance (probably the best in Hawke’s career), Irish director Aisling Walsh has delivered near counter-programming for summer. Lesley Coffin: Embarrassed to admit that before seeing the film, I didn’t know the name Maud Lewis and only after watching the film did I look her up and see some of her art. How familiar were you with her and her work? Aisling Walsh: Not at all. But I was trained as a painter so there was something about her in the script that really spoke to me. I understand the drive she had to be an artist. And then of course I looked her up on the internet and thought how remarkable she was and that her story needs to be told. She struggled to be the artist she wanted to be, that was one part of the story. But there was also this complicated relationship she had with this man. And so much of the film is a portrait of their relationship. Lesley Coffin: When you started doing research on her art and seeing it for yourself, did you find there was a progression in her work that you could use to show how time passed in the film? Aisling Walsh: She paints those little cards at the beginning and progressively did larger pieces. And there’s a huge moment when she finally puts Everett into a painting. She painted him a lot. The paintings became about their relationship and what their life was like. But her greatest work of art is that house. Lesley Coffin: You were able to visit the house, but what was it like recreating the house? Aisling Walsh: We visited the house to do research, but had to create the house completely. We actually had to build four versions of the house. Lesley Coffin: And you were able to film in sequential order so the paintings could be added as the story progressed? Aisling Walsh: We were lucky because most of our shooting in the house we were able to do in order. We did have to go back to film some scenes in the winter. But it was remarkable that we’d go off and film somewhere else for a day and the art department managed to create that art work in a day. The walls were the things she liked painting or perhaps things she simply wanted to try to paint before putting them in a painting. Because no one knows the history of that house, we had to take some liberties and think of how some of them came to be. A major part of her work were the things she saw looking out the windows and doors of that house. She often painted snow scenes but would put cherry blossoms around the edges, because those were things she really liked painting. Lesley Coffin: Did you hire a specific artist to recreate her art work? Aisling Walsh: We had a couple of artists. We had a girl in the art department who painted all the cards, ceiling painters did most of the wall art. But all their work was overseen by the art director. And the production designer’s brother came from Ireland to create some of her paintings. Lesley Coffin: The relationship in the film is hard to watch because it is so antiquated from what we believe a functional relationship should be. Were concerned about how contemporary audiences would react? Aisling Walsh: It’s very hard for a younger audience to understand how women were treated in 1936. A woman like Maud who got pregnant and being disinherited by her brother. Her life would have been completely different if her parents hadn’t died. But she always knew she wanted her own life. That’s what’s so modern about her story. And she had her own life with Everett. But it’s challenging for modern audiences to understand what makes Everett behave that way. He comes from a time when hitting a woman was acceptable. But what you see from those moments is the fact that this relationship wasn’t easy for either of them. And he would have never understood what it meant to share his life she hadn’t arrived. He would have never been exposed to the beauty she brought to their life, but that needed to come from that struggle. Marriages were so different then and they were two people completely alone in the world. Lesley Coffin: Everett is the quieter character, we know less about his life before Maud. Was he a harder character to develop and shape than Maud? Aisling Walsh: He was. Maud’s such an easy character to like because she is such an underdog. She’s making a desperate plea for her freedom, she has a disability, and the rest of the world seems to be against her. And he’s this silent, difficult person. It was a challenge for Ethan to take on that role. He’s a silent, brutal sort of man who is civilized by the end of the film. I always wanted the audience to fall in love with him by the end of the film, to understand him and see why she loves him. Lesley Coffin: I think this might his best performance, but it’s also a bit of unexpected casting. What made you think of him and Sally for the roles? Aisling Walsh: Sally I’d worked with before, and the moment I read the script, I knew no one else could play the role. Besides saying yes to a film, the biggest decision you make as a director is deciding who you’ll cast. And I knew, just by looking at his work, that Ethan would be amazing in the role. I knew it would be a challenge for him. The film is called Maudie, it’s about her, and so we needed a very special man to collaborate with. I think it’s a remarkable performance because there’s nowhere to hide, you have to be completely truthful. Lesley Coffin: Maud was a woman with disabilities and Sally has to show how that affected her life. But both of you underplay that aspect, where others might have put that aspect of her character front and center. How did the two of you decide how to depict that aspect of her life? Aisling Walsh: We felt it was important to remember that people who suffer from these types of disabilities do live with them. They suffer from pain and challenges, but they also keep going. So there are moments when she’s a bit more tired or nervous, when she limps a bit more. And it got worse overtime. But that isn’t what defined her either. And I give Sally credit, because it’s natural to want to show more when playing someone with a disability, rather than underplay it the way she did. We considered using things like prosthetics, but we felt that would be going too far and Sally felt she could do most of it herself. Lesley Coffin: Was it helpful to be filming in Newfoundland and film in the harsh elements? Aisling Walsh: Oh yes, and when I first signed on the thought had been to build the house in a studio. But I just thought it wouldn’t work. What if Everett wants to walk out the door or Maud looks out the window. We decided we need to just brave it out and bring that reality. And then we went back in the winter, because she painted so much in the winter, we needed to see how brutal winter could be, especially for an older lady with arthritis. Originally, they considered casting old and young versions of Maud and Everett, but I just felt that wouldn’t work. Lesley Coffin: I don’t think it wouldn’t have worked because your growing affection for Everett and their marriage would have been interrupted by the recasting. Aisling Walsh: Exactly, that’s such a huge part of the movie. And in the end, I don’t think people even question their age. And I have to hand it to them, Ethan and Sally embraced filming in the cold. Lesley Coffin: Why do you think she isn’t better known and appreciated as an artist today? Aisling Walsh: I think there are misconceptions about her work. Because of her style, people think what she did was easy, but as our artists discovered, it isn’t. She wasn’t trained or educated, she was completely self-taught. And she sold most of her work in her lifetime, and most only sold for a few dollars so it’s been undervalued. But she made a living as an artist. Lesley Coffin: Who made the decision to start the story when Maud meets Everett? Aisling Walsh: I did. There were versions of the script where we see Maud as a child or young woman. The challenge with true life stories are to determine when the story starts, and when the story ends. You could start a life story anywhere, but you have to shape it. And her story as an artist really started when she met Everett, so we needed to get her out there as quickly as possible, but still show enough about her life that you understand her desperation. Lesley Coffin: How did you select the music and original song? Aisling Walsh: Very early in the process, I decided a big, dramatic orchestra wouldn’t be right for this film. And I knew Michael Timmins band Cowboy Junkies, and felt it would be interesting to have someone like him approach the score and give it a very simple sound. I was inspired by the score to Heaven’s Gate, this very beautiful but very simple sound. And that’s what I wanted this film to sound like. It had to feel like it came from their world. And Michael came back and forth to Dublin, and gave me different things and we finally found the right sound. The film didn’t need a big score, I think that would have been pushing the drama too hard. Lesley Coffin: She’s referred to as Maud in the film, why did you choose to title it Maudie? Aisling Walsh: He calls her Maudie once in the film. And the film is about her life, and how her presence in his life changed him. He’s the character who changes and grows, and becomes the kind of man who can call her Maudie. People who knew her well called her Maudie, so we felt we should hear him say it at least once.